In today's lesson, you will begin to learn the basics of computer programming. 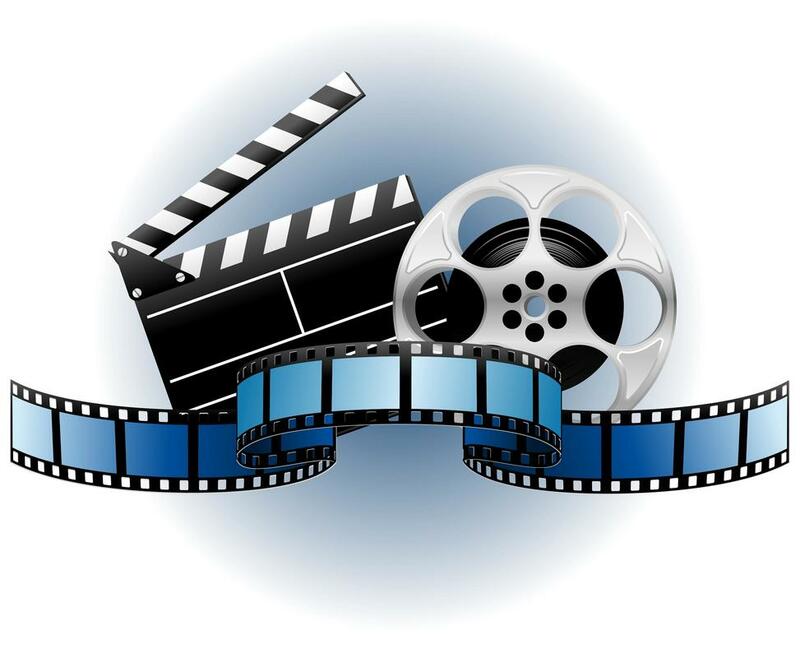 To start, we are going to watch a video. ​Today we are going to play, The Amazing Race! Remember, in the Amazing Race your team races against the other teams in the class to win Challenges. The team that wins the points totaled from all the Challenges, wins the game. In this challenge, you will program a robot to draw a code using a set of commands. Choose one person in your group to be the Robot. Choose one person in your group to be the Programmer. The other two group members are the Debuggers. I will hand out two envelopes to each group. Do not open the envelopes until I say go. I will give one of the envelops to the Robot. The envelope will contain a piece of graph paper and a marker. I will give the other envelope to the Programmer. It will have a list of commands that you will read to the Robot. After I say go, you will open your envelopes. The Programmers will guide the Robots' Automatic Realization Machine (or Arm) with the simple commands. The Robots will use a sheet of graph paper to draw the programmer's commands. The Robots will start in the upper, left hand corner of the paper. The Debuggers will watch the Robot and listen to the Programmer. They may not say anything. Debuggers will take notes if they hear a Programmer not read a command properly or they see the Robot not perform a command properly. When the Programmer has read all the commands and the Robot has finished performing all the commands, the Robot will bring me their graph drawing. While the Robot is at my desk, the Debuggers will tell the Programmer how many mistakes (if any) they made in reading the commands, but not what they were. If the Robot hands me an incorrect graph drawing, I will simply shake my head and give you another piece of graph paper. The Robot will return to the table. The Debuggers will tell the Robot how many mistakes he or she made performing the commands and how many mistakes the Programmer made in giving the commands. Again, they can not say what the mistakes were or when they occurred. The Team will repeat the process until they get the correct drawing. When you come to me with the correct drawing, I will hand you another one to do. Your group will do 3 in all. Your placement determines how many points you get for the round. When the group completes all three graphs correct, you are done with Challenge 1 of the Race. I will let you know how many points you received in this Challenge and what your place is in the Race so far. All teams have to complete the Challenge. You may play the Speed Typing Game while you wait on other teams to complete Challenge 1. Remember, Debuggers are not to talk when the Robot comes to the group. Programmers can only read the instructions. they may not give hints. You may not be up walking around the room. Every team must complete the Challenge. Be good sports. No trash talking or complaining if I send you back. If you break a rule, you are disqualified. The chart below tells you the commands that you may give the robot. Below, is an example of an algorithm in two forms. In the first form, the algorithm is coded, or what the Robot will draw. In the second form, the algorithm is written in commands, or what the Programmer will tell the Robot. 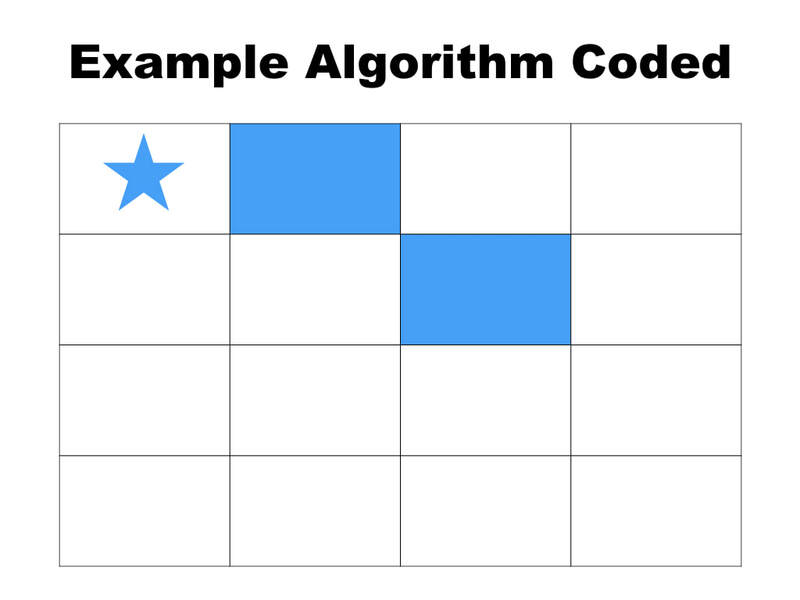 In Challenge 2, you will translate algorithms into symbols to make program code. Your group will race against the other groups in the class to finish Challenge 2. Each group will be given an envelope of 6 cards with graph paper algorithms, a key of coding symbols, and 6 pieces of blank paper for coding. 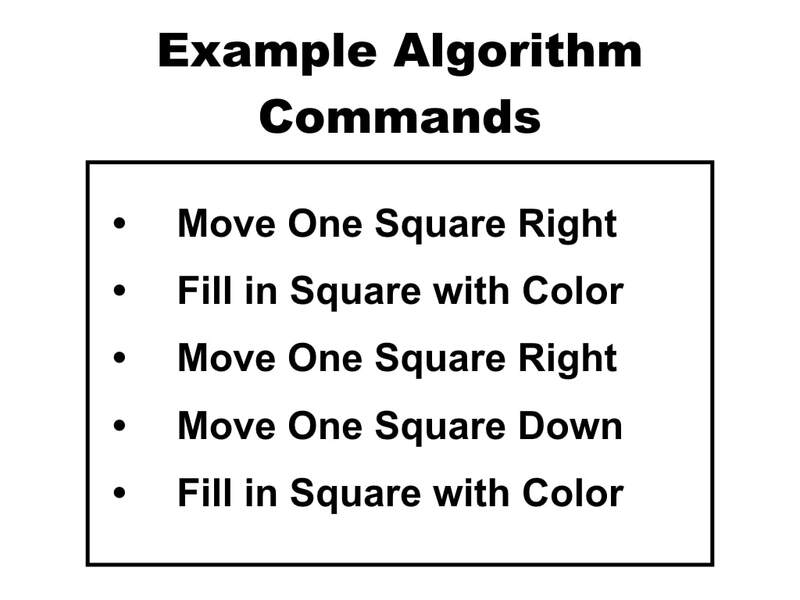 You will work with your group to translate the 6 graph paper algorithms into program codes of symbols. When your group has finished translating all 6 algorithms to code, one group member will bring them to me. If your program codes are incorrect, I will simply shake my head no and give you back the codes. You will need to look them over and find your mistakes. If your program codes are correct, I will tell you your place and the points you received for Challenge 2. You must stay with your group. No walking around the room. Every member must participate. No relying on the responsible, brainy kid to do all the work! Onlyo ne person may bring me the codes when you are done. Below is a chart of the program codes. Below, are two pictures. 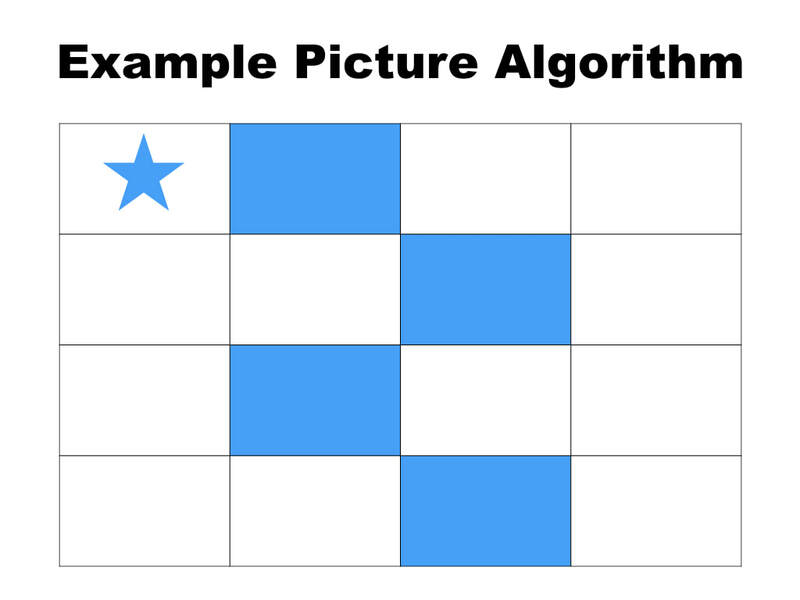 The first is an example of a picture algorithm. 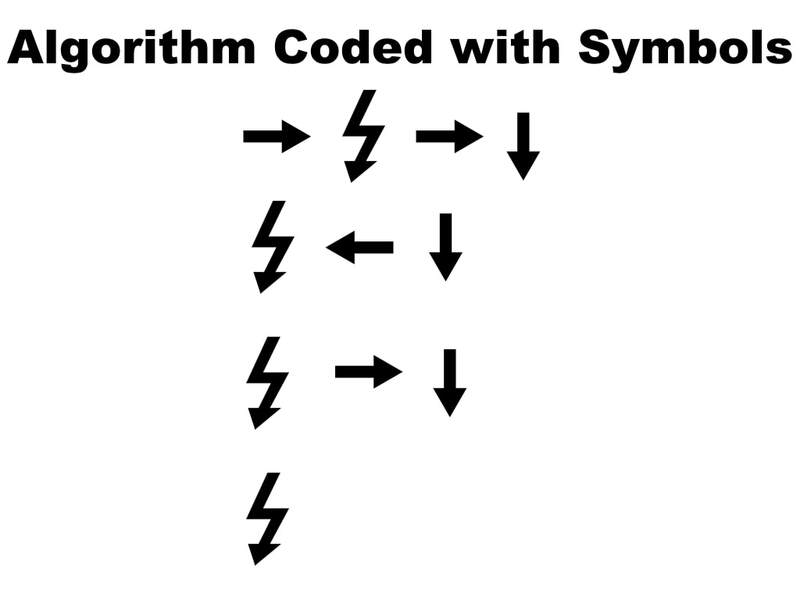 The second is the picture algorithm translated into code with symbols. Challenge 3 is a Quiz Show. 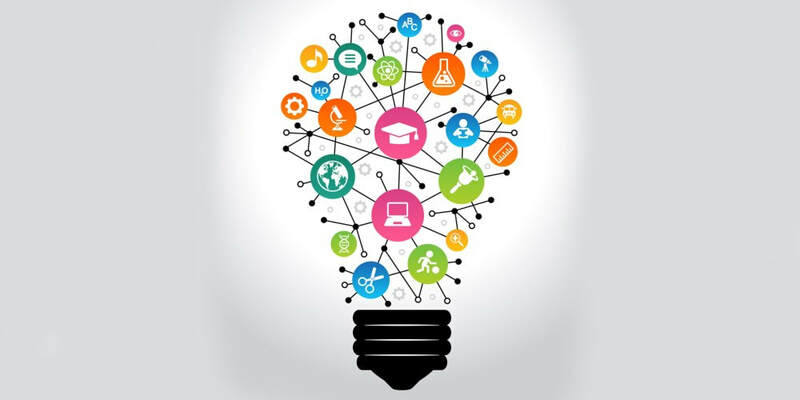 Teams will compete against each other to answer the most questions correct. In Challenge 3, your team will compete against the other classroom teams in a game called Programming Code Jeopardy. 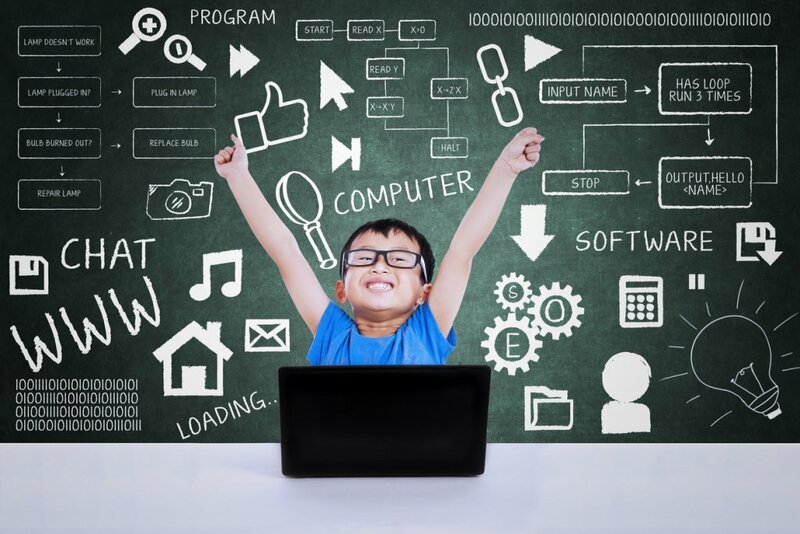 All students need to log out of their computers. The game will be displayed on the overhead. Teams will pick a number 1 - 7. The team that gets the teacher's written number will choose the first category. One member from each team will go to the buzzer table. The teacher will ask what category and for how many points. The teacher will read the question. If you buzz in before the question is read, you must answer the question. The first team to buzz in has ten seconds to answer one answer questions, thirty seconds to answer short answer questions, and 1 minute to answer questions that must be written or drawn. The team must answer in the specified time period or they forfeit their turn and another team may answer. 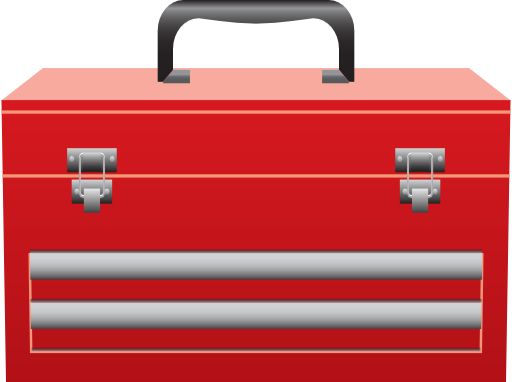 Team members may not get help from their team mates. The team member that answers the question correctly, wins the points for their team. When all the questions have been answered, the teams will receive their placements. Each place receives the following amount of points in the Amazing Race. Every team member must take turns going to the buzzer table to answer questions. Everyone must be quiet during the Question and Answer. Teams must show good sportsmanship. Teams cannot help team members at the buzzer table. This is considered cheating. The consequence for talking during questions or answers is the guilty team will lose one fourth of their accumulated points so far. The consequence for bad sportsmanship is the guilty team will lose half of their accumulated points so far. The consequence for cheating during questions or answers is the guilty team will lose all of their accumulated points so far. I will display the quiz here, but I have embedded it so that you can play it at home if you like. I will now add all of your points and give the final placements for the Programming Code Amazing Race! Coding Lesson 1: Graph Paper Programming. Standard 1: Use numbers or letters to represent information in another form. Examples: Secret codes, Roman numerals, or abbreviations. Standard 2: Analyze a given list of sub-problems while addressing a larger problem. Standard 3: Recognize that different solutions exist for the same problem or sub-problem. Standard 6: Test and debug a given program in a visual environment using arithmetic operators, conditionals, and repetition in programs in collaboration with others. Example: Block-based visual programming language.